It's a reminder that the struggle for human rights never ends. Barry Ward and Simone Kirby star in Jimmy's Hall. Directed by Ken Loach. With Barry Ward and Simone Kirby. Opens Friday. It should be obvious by now to even the most casual fans of independent movies that Ken Loach is one of the world's finest filmmakers. From the poignant naturalism of Kes to the uproarious construction-worker farce Riff Raff and the nostalgic sporting fable Looking for Eric, Englishman Loach delights in the stories of ordinary people trying their best to get along in the world, against occasionally murderous odds. Sometimes the tale is pithy and ironic, but more often it carries an overwhelming sheen of sadness. The subject is usually social justice — how important it is, and how hard to achieve. 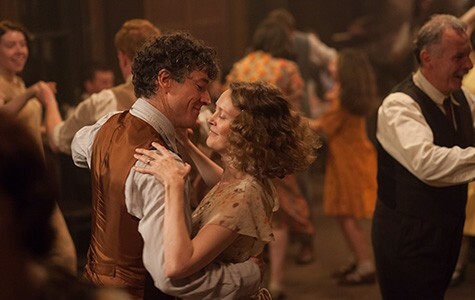 When world traveler Jimmy Gralton (Barry Ward) returns to his little hometown in County Leitrim, Ireland, from New York City in the 1930s and reopens the Pearse-Connolly Hall as a place for dancing, singing, and discussing books with progressive ideas, hard-barked parish priest Father Sheridan (Jim Norton) reacts as if the devil himself were setting up shop. Jimmy and his friends expect some blowback from "the masters and the pastors," but the ultra-conservative hatred of humanist ideals turns into a full-fledged, violent witchhunt, with cops raiding homes and fathers beating unruly daughters. Leave it to Loach — director of the Irish Rebellion saga The Wind That Shakes the Barley — to explode the sentimental image of the kindly village curate and his obedient flock. Father Sheridan and the bishops, typically shown enjoying tea and crumpets in prim parlors, obviously fear any "outside" education of their parishioners and put the blame on atheistic communists trying to stir up trouble. And the IRA is too caught up in its own power plays to offer Jimmy any support. So he and his pals batten down the hatches and read their newspaper, The Irish Workers' Voice, expecting the doors to be kicked in at any moment. First they fought the English, now the church. Hats off to actors Ward, Norton, and Simone Kirby (as Jimmy's lost love, Oonagh), and especially to Loach and screenwriter Paul Laverty (adapting Donal O'Kelly's play). They could be making harmless little character studies of quaint country folk, but they'd rather keep reminding us that the struggle for human rights never ends.